In large bowl, mix flours, baking soda, salt, cinnamon, nutmeg, cloves and ginger; make well in center of mixture. In medium bowl, stir sugar, oil, water and eggs with whisk. Stir in pumpkin; add to flour mixture, stirring just until moistened. Divide batter evenly among muffin cups. Bake 25 minutes or until toothpick inserted in center comes out clean. Cool 5 minutes; remove from pans to cooling racks. Serve warm or cool. There are some best practices for mixing up quick breads, most importantly not overmixing the batter. The dry ingredients should just be moistened by the wet ingredients—and it’s okay if there are still some small pockets of floury ingredients as you spoon the batter into the muffin tin. Grease only the bottom of the tins, so the batter can climb up the sides evenly, yielding muffins with gently rounded tops—no peaking or tunnels running through the inside. The best muffins should be golden brown, slightly rounded with bumpy tops, tender, moist, even textured and easy to remove from the pan. Here are some things that can happen, with solutions to help. Pale: the oven was not hot enough. Peaked or smooth on top: too much mixing. Tough and heavy: too much flour or mixing. Dry: too much flour, oven too hot or baked too long. Tunnels: too much mixing. If your muffin tins have a dark nonstick surface, you may want to reduce the oven temperature by 25°F or remove the muffins from the oven a little earlier. The dark surface absorbs heat, speeding up the baking process. Freeze the muffins in large resealable freezer bags, so they’re ready and waiting for breakfasts on the go. Wrap them in waxed paper and reheat them individually (from frozen) in the microwave on HIGH for about 30 seconds, just until heated through. Coffeeshop chalkboards all over town are heralding the arrival of autumn’s favorite beverage. Now you can offer your own creative culinary take on the season’s most beloved flavor combination. Packed with cinnamon, nutmeg, cloves and ginger, these tasty muffins are like a Pumpkin Spice Latte on a plate—but better, because you made them yourself. Easy pumpkin muffins take only 15 minutes to pull together, so they’re even a do-able breakfast option on those first mornings when you feel a distinctive chill in the air. Here’s one important baker’s note: Take it easy with your wooden spoon when you’re mixing the batter, because a light tough is enough to do the trick. For this recipe, stir just until the dry ingredients are incorporated to avoid overmixing, which can cause what bakers call “ tunnels,” leading to a tougher texture in the muffins. 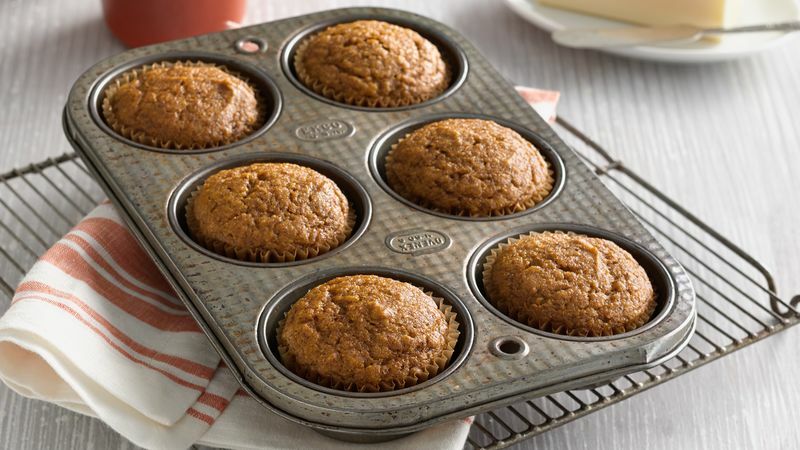 If this you’d like to find even more, try Betty’s collection of best-ever pumpkin muffins.